This marks the first intercept of two Shaanxi Y-9J maritime patrol aircraft in 2019. 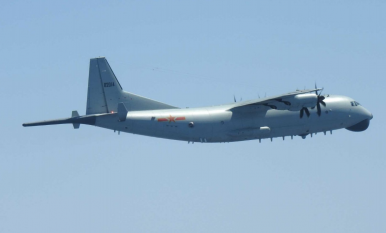 The Japan Air Self Defense Force (JASDF) scrambled fighter jets on March 20 to intercept two Chinese People’s Liberation Army Air Force (PLAAF) Shaanxi Y-9JB (GX-8) electronic warfare and surveillance planes in the East China Sea. Japan’s airspace was seemingly not violated, the MoD reports. The last JASDF scramble against a Y-9JB aircraft took place on February 23, which constituted the first intercept of a Chinese aircraft following an eight-week hiatus. Another intercept of a PLAAF military aircraft near the Japanese islands occurred on December 27, when JASDF also intercepted a Y-9JB aircraft. A preceding intercept mission took place on December 14. Additionally, Japanese fighters also conducted scrambles against PLAAF and People’s Liberation Army Navy Air Force (PLANAF) aircraft on November 26 and on October 29. Furthermore, intercepts occurred on August 29 and July 27, as well as in June when a Y-9JB, flying through international airspace between Okinawa and Miyako, was intercepted. As I noted previously, the PLAAF and PLANAF usually conduct their surveillance patrols with Y-9JBs, an upgraded variant of China’s first-generation Y-8DZ and Y-8G electronic reconnaissance aircraft, over the East China Sea and Sea of Japan. In 2015, the Y-9JB was reportedly upgraded with a 5,000-horsepower 6C turboprop engine with six-blade composite propellers to enhance its range and endurance. Additionally, the aircraft was retrofitted with improved cabin pressurization for missions in higher altitudes. It purportedly has also been equipped with upgraded electronic systems, including new fairings and antennas. Up until September 2018, a total of 345 Chinese intercepts have been recorded by the JASDF for the year. This constitutes an increase of 58 sorties, in comparison to fiscal year 2017. Past Chinese missions included H-6K long-range bombers, Tupolev Tu-154MD electronic intelligence planes, and Sukhoi Su-35 multirole fighter jets. As during past PLAAF maritime reconnaissance missions, the Y-9B also entered South Korea’s air defense identification zone (KADIZ) on February 23, according to South Korean media reports. The Republic of Korea Air Force scrambled fighter jets in response. Air defense identification zones are not considered sovereign or territorial airspace and sections of the KADIZ overlap with air defense identification zones designated by China and Japan. In February, the JASDF intercepted four nuclear-capable Russian Tupolev Tu-95MS strategic bombers and four Sukhoi Su-35S (Flanker-E+) multirole fighter jets flying in two separate formations over the east and west coasts of Japan. The February 15 intercept took place after a three-and-a-half-week hiatus of Russian long-range patrols. The intercept took place on February 23 and is the first after an eight-week hiatus.